Furniture. That is the topic up for debate today. When Moose and I got married, I scored a deal on a $200 couch from the Ashley furniture showroom. Then, we inherited a loveseat from my parents and my grandfather gifted us a recliner. That completed our main loving area for years. When we moved into our current home, there was a den and formal living room. One of Moose's friends offered us a cute chair/couch set for free, so we took it. That settled our furniture woes for quite awhile. Recently, I've been lamenting about couches and chairs and decor. If we're honest, I've been lamenting about a new house and keeping myself content with new decor! Ironically, my mom has had the redecorating fever as well. Long story short, mom and dad went to purchase a couch and came home with a whole set for their den. I thought I could be appeased by selling my mismatched den furniture and purchasing their hand-me-down set. So, we made that happen. I sold my couches, my parents got theirs moved in, and Moose and my brother moved mom and dads couches to my house. Yall, let's just be honest. There are just some random things that set us off emotionally. This was one. The couches didn't look like I had expected them to and the options in my head were as follows: forget it and put my old couches (that I discovered were dirty and had already posted for sale) back in the room, paint the walls a different shade, sell these couches too and buy something new. I think the issue was that we had never had anything new. We were grown ups, but had never had grown up furniture. I wanted new. Moose totally didn't get that. Even now, he says "do we have to spend X on furniture? We can go see what they have at the thrift store." Me: "The THRIFT store?!? We are adults. I would like at least one room on the house to include furniture that is ours and only ours." Moose-"okay then." Ha! It's so good that only one of us is over the top emotional and the other is mellow and relaxed. I bet you can't pinpoint which is which! So begins the great sofa/loveseat search of 2015. I wanted cozy, but still cute. Something you could nap on, but still had structure. A nice fabric, but one that wouldn't show stains or dog hair. Basically, I wanted to find the perfect investment. I understood that this may be my one shot in several years...and considering it is our first grown up furniture purchase, it was kind of a big deal. Mom and I went and the sales lady helped me narrow it down to a few options to show Moose over the weekend. We went back on Saturday and Moose could have literally been on a different planet, but "we" made a decision and made the plunge. On the way home, he said, "Megan, I just don't really care. As long as I can lay on it and watch tv, I don't care if it is new, used, beown, or purple." Well, glad you agreed on a couch with me and "we" picked one out based on your high recommendations. Eek. Guys, you may judge me for this post. You may also think I'm gross...but I don't care. I have to tell you about this journey. When I entered into the fantastic teenage years (oh wow) 15 years ago, I realized immediately that I was a greasy-haired girl. On top of that, my hair reacts in extreme ways to conditioner, different pH water, and just about any product you can put on it. I have struggled for years. My skin is intolerant of anything citrus, breaking me out like nobody else. So, that kills about half of the hair products in the world right there. Adding to these other issues, my scalp has been super dry for the past five years. (I learned in college that it is actually normal to have oily hair and dry scalp---something about excess sebum production due to the dryness on your scalp....google it, it is a thing). All that to say--hair care products are hard to find! I began the journey to find the perfect dry scalp, oily hair, adaptable shampoo/conditioner about 10 years ago. I never found it. Several things worked well for about a year and then my head would get used to the product and it would no longer be effective. It's a struggle. For me, hair care is incidental to good scalp care, so I need a shampoo to serve two basic functions: talking my scalp down from the dry, itchy ledge it lives on, and cleaning up after its overzealous oil production. Ahh! Other people think like me! I mean, THIS may be the answer I am searching for. I did some research and learned about french green cosmetic clay (what?!) and that you can buy it on Amazon. Basically, it is a powder form of a beauty clay and is important to this recipe. It also includes green tea, which I keep in my pantry (I totally used K-cups that I got at a discount store so that I didn't have to wait on the green tea to brew), tea tree oil (which I keep on hand, but I'm not sure it is absolutely essential to the mixture unless you have SUPER dry scalp), and Dr. Bronner's Castile soap. Now, because I wasn't on the hippie train before this experiment, I had no idea what Dr. Bronner's Castile soap was. This stuff is crazy! It can be used to do anything from wash your body to mop the floors (and I'm not exaggerating). Research it. It's crazy. I bought a bottle of Peppermint Castile Soap because I already knew that I love peppermint essential oils and I figure a little aromatherapy in the shower can't hurt! I sat around with these ingredients in my house for months. I couldn't make the plunge. Then, came Christmas Eve. My sweet Sister-in-law made the offhand comment "I just use what's called the curly girl method on my hair now, not shampoo." That, my friend, was the push I needed. If I didn't know Whitney wasn't using shampoo, I could do this! I also had the week off from any sort of work and knew from reading lots of blogs that week one could be sort of a grease pit. My ego was concerned that I would look like I just got out of a swimming pool for weeks while my hair oil balance got right! After first wash and dry, it looked a little oily, but not too bad. From the front, you couldn't really tell any difference. It's quite a bit more liquidy and less gritty and clay-like, but the texture of my hair is 1000 times better. I have noticed, however, that it leaves my hair sort of feeling like a broom (in other words dried out a bit too much!) SOOOO I did more research. 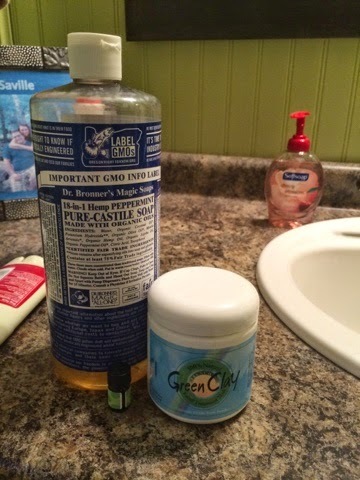 I found this article about why this blogger no longer does the no-poo method with Dr. Bronners. However great her points were, they weren't strong enough to stop me. I did take away that a vinegar rinse removes any residue left behind and can balance out the pH of your hair, also making it silky smooth. THIS seemed like the answer to my texture issues, since the look was right, but the texture was a little off. I bought some apple cider vinegar and put 1-2 tablespoons in a solo cup (to the line indention at the bottom of the cup...it really is rocket science). Then, I filled the cup to the top with cold water (this is apparently better for your pores and hair follicles). After washing my hair with the soap/clay mixture and rinsing it in the shower, I made a bun and poured the vinegar rinse over my scalp and hair. I left it while I shaved my legs (told you, rocket science), then rinsed it out. Finally---perfection! I think I'll just keep the cup in the shower to add vinegar to. I'm a fan. Now that I've given you wayyyy too many details for how to wash your hair my way, I'm sure it's clear as mud (literally!). I've found that I can keep about a week's worth in the shower at a time and not have to make it daily. I've also used just the Dr. Bronner's, but that DEFINITELY requires a vinegar rinse, as it strips allllll the oil from your hair. What about you? Anybody out there doing a different no-poo method???? Let me know!!! So the past month and a half has been a total and complete blur to me! I had a six week long-term sub in 8th grade English. It totally pulled me out of my comfort zone and forced me to teach an objective subject with a group of artsy, ELA minded folks. Y'all--I'm a math and science girl for a reason! It was fun, though! I am truly, madly, deeply in love with Palmetto Middle School and the ability to "work" there for 6 straight weeks made me a super happy girl. Hope to do some more long terms before this Masters is finished. We went on a super fun trip to Nashville to round up our Christmas/New Year vacation. Moose, Micah, and Tyler had planned a boys trip and to not be outdone, Chels, Andi, and I had a companion girls trip. We all went to Nashville and had one dinner together, but otherwise, we did our own thing. The girls spent time hanging around downtown Franklin, the Opryland hotel, and basically lounging around for three days! We loved it! In January, we had a fun shooting range date. It was Chelsea's first experience shooting a gun. This was a follow up to my creative zombie chasing date from our Christmas Party. We ended up going as a foursome and had a really great time. We had another guys night/girls night as well. The boys spent HOURS playing video games and we got our craft on. I painted the owl. (I think I have an owl addiction....not exaggerating). For Valentines Day, mom planned a 50's style sock hop for the kids at church. Chels and I laughed that we were Sandy from Grease...pre Danny and post Danny! The kids had a great time and even danced a ton.